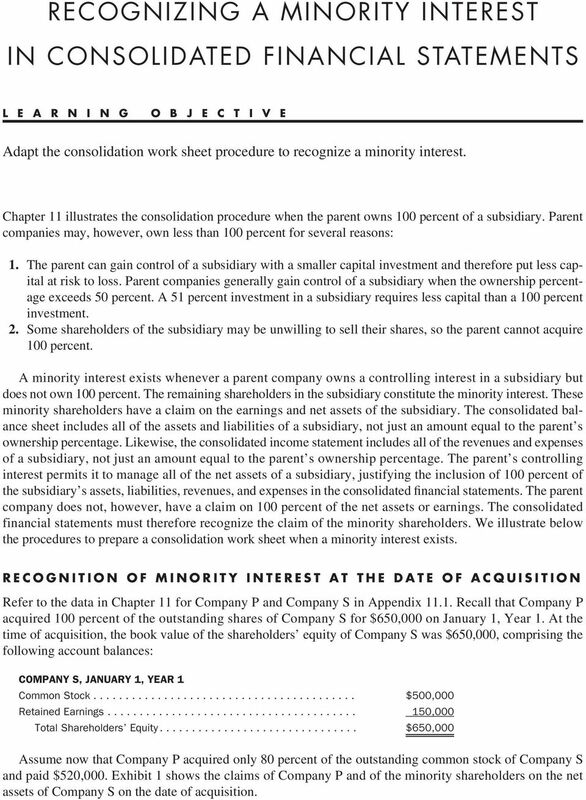 Download "RECOGNIZING A MINORITY INTEREST IN CONSOLIDATED FINANCIAL STATEMENTS"
1 RECOGNIZING A MINORITY INTEREST IN CONSOLIDATED FINANCIAL STATEMENTS L E A R N I N G O B J E C T I V E Adapt the consolidation work sheet procedure to recognize a minority interest. Chapter 11 illustrates the consolidation procedure when the parent owns 100 percent of a subsidiary. Parent companies may, however, own less than 100 percent for several reasons: 1. The parent can gain control of a subsidiary with a smaller capital investment and therefore put less capital at risk to loss. Parent companies generally gain control of a subsidiary when the ownership percentage exceeds 50 percent. A 51 percent investment in a subsidiary requires less capital than a 100 percent investment. 2. Some shareholders of the subsidiary may be unwilling to sell their shares, so the parent cannot acquire 100 percent. A minority interest exists whenever a parent company owns a controlling interest in a subsidiary but does not own 100 percent. The remaining shareholders in the subsidiary constitute the minority interest. These minority shareholders have a claim on the earnings and net assets of the subsidiary. The consolidated balance sheet includes all of the assets and liabilities of a subsidiary, not just an amount equal to the parent s ownership percentage. Likewise, the consolidated income statement includes all of the revenues and expenses of a subsidiary, not just an amount equal to the parent s ownership percentage. The parent s controlling interest permits it to manage all of the net assets of a subsidiary, justifying the inclusion of 100 percent of the subsidiary s assets, liabilities, revenues, and expenses in the consolidated financial statements. The parent company does not, however, have a claim on 100 percent of the net assets or earnings. The consolidated financial statements must therefore recognize the claim of the minority shareholders. We illustrate below the procedures to prepare a consolidation work sheet when a minority interest exists. 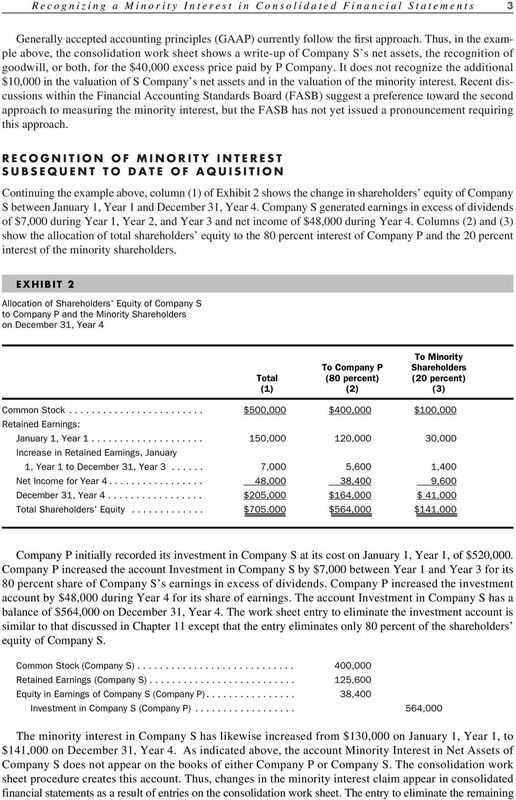 RECOGNITION OF MINORITY INTEREST AT THE DATE OF ACQUISITION Refer to the data in Chapter 11 for Company P and Company S in Appendix Recall that Company P acquired 100 percent of the outstanding shares of Company S for $650,000 on January 1, Year 1. At the time of acquisition, the book value of the shareholders equity of Company S was $650,000, comprising the following account balances: COMPANY S, JANUARY 1, YEAR 1 Common Stock $500,000 Retained Earnings ,000 Total Shareholders Equity $650,000 Assume now that Company P acquired only 80 percent of the outstanding common stock of Company S and paid $520,000. Exhibit 1 shows the claims of Company P and of the minority shareholders on the net assets of Company S on the date of acquisition. 2 Recognizing a Minority Interest in Consolidated Financial Statements 2 EXHIBIT 1 Allocation of Shareholders Equity of Company S to Company P and the Minority Shareholders on the date of acquisition To Minority To Company P Shareholders Total (80 percent) (20 percent) (1) (2) (3) Common Stock $500,000 $400,000 $100,000 Retained Earnings , ,000 30,000 Total Shareholders Equity $650,000 $520,000 $130,000 The worksheet entry to eliminate the Investment in Company S account, which appears on the books of Company P, is as follows: Common Stock (Company S) ,000 Retained Earnings (Company S) ,000 Investment in Company S (Company P) ,000 The work sheet entry to recognize the minority interest claim on the net assets of Company S is as follows: Common Stock (Company S) ,000 Retained Earnings (Company S) ,000 Minority Interest in Net Assets of Company S (Consolidated Balance Sheet) ,000 The account Minority Interest in Net Assets of Company S does not appear on the books of either company. Rather, the work sheet entry above creates this account. 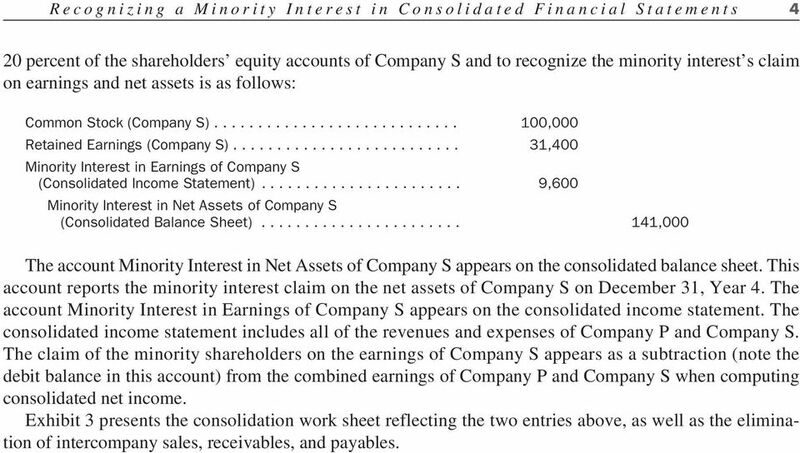 The consolidated balance sheet includes all of the assets and liabilities of Company P (except the Investment in Company S account eliminated in the first entry above) and of Company S. The 20 percent claim of the minority shareholders against the net assets of Company S of $130,000 typically appears between liabilities and shareholders equity on the consolidated balance sheet. Conceptual Note. A conceptual issue arises regarding the valuation of the minority interest in the net assets of a subsidiary when the parent paid more than the book value of the subsidiary s net assets on the date of acquisition: 1. Should the minority interest reflect the book values on the subsidiary s books, or 2. Should the minority interest reflect the market values of the subsidiary s net assets implied by the price paid by the parent for its interest in the subsidiary? 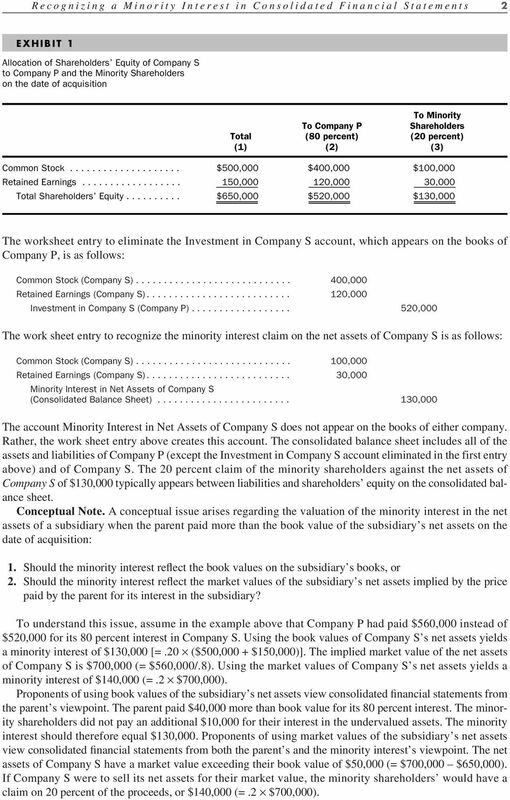 To understand this issue, assume in the example above that Company P had paid $560,000 instead of $520,000 for its 80 percent interest in Company S. Using the book values of Company S s net assets yields a minority interest of $130,000 [=.20 ($500,000 + $150,000)]. The implied market value of the net assets of Company S is $700,000 (= $560,000/.8). Using the market values of Company S s net assets yields a minority interest of $140,000 (=.2 $700,000). Proponents of using book values of the subsidiary s net assets view consolidated financial statements from the parent s viewpoint. The parent paid $40,000 more than book value for its 80 percent interest. The minority shareholders did not pay an additional $10,000 for their interest in the undervalued assets. The minority interest should therefore equal $130,000. Proponents of using market values of the subsidiary s net assets view consolidated financial statements from both the parent s and the minority interest s viewpoint. The net assets of Company S have a market value exceeding their book value of $50,000 (= $700,000 $650,000). If Company S were to sell its net assets for their market value, the minority shareholders would have a claim on 20 percent of the proceeds, or $140,000 (=.2 $700,000). 4 Recognizing a Minority Interest in Consolidated Financial Statements 4 20 percent of the shareholders equity accounts of Company S and to recognize the minority interest s claim on earnings and net assets is as follows: Common Stock (Company S) ,000 Retained Earnings (Company S) ,400 Minority Interest in Earnings of Company S (Consolidated Income Statement) ,600 Minority Interest in Net Assets of Company S (Consolidated Balance Sheet) ,000 The account Minority Interest in Net Assets of Company S appears on the consolidated balance sheet. This account reports the minority interest claim on the net assets of Company S on December 31, Year 4. The account Minority Interest in Earnings of Company S appears on the consolidated income statement. 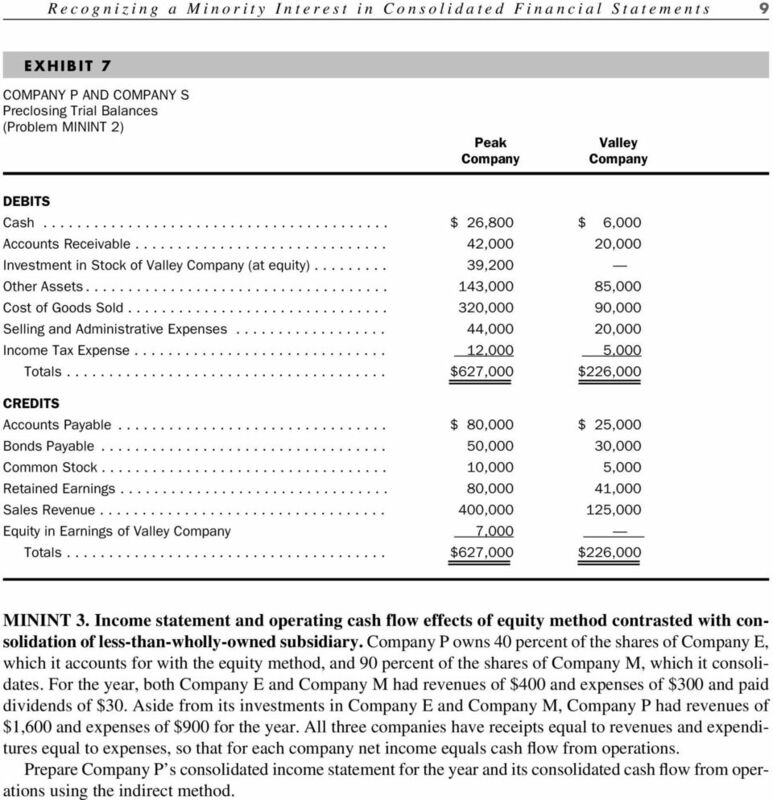 The consolidated income statement includes all of the revenues and expenses of Company P and Company S. The claim of the minority shareholders on the earnings of Company S appears as a subtraction (note the debit balance in this account) from the combined earnings of Company P and Company S when computing consolidated net income. Exhibit 3 presents the consolidation work sheet reflecting the two entries above, as well as the elimination of intercompany sales, receivables, and payables. 5 Recognizing a Minority Interest in Consolidated Financial Statements 5 EXHIBIT 3 COMPANY P AND COMPANY S Work Sheet to Derive Consolidated Financial Statements Based on Data from Preclosing Trial Balances for Year 4 Adjustments and P and S Company P Company S Eliminations Consolidated Debit Credit Debit Credit Debit Credit Debit Credit Trial Balance Accounts Accounts Receivable $ 200,000 $ 25,000 (2) $12,000 $ 213,000 Investment in Stock of Company S 564,000 (1) 564,000 - Other Assets 2,280, ,000 3,255,000 Accounts Payable $ 75,000 $ 15,000 (2)$12,000 $ 78,000 Other Liabilities 70, , ,000 Common Stock 2,500, ,000 (1)400,000 2,500,000 (4)100,000 Retained Earnings: Company P 204, ,600 Company S 157,000 (1)125,600 (4) 31,400 Sales 900, ,000 (3) 40,000 1,110,000 Equity in Earnings of Company S 38,400 (1) 38,400 Cost of Goods Sold 440,000 80,000 (3) 40,000 $ 480,000 Depreciation Expense 120,000 50, ,000 Administrative Expense 80,000 40, ,000 Income Tax Expense 104,000 32, ,000 Minority Interest in Net Assets of Company S (4) 141, ,000 Minority Interest in Earnings of Company S. (4) 9,600 9,600 Totals $3,788,000 $3,788,000 $1,202,000 $1,202,000 $757,000 $757,000 $4,383,600 $4,383,600 (1) To eliminate the investment account against 80 percent of the shareholders equity of Company S. (2) To eliminate intercompany receivables and payables. (3) To eliminate intercompany sales. 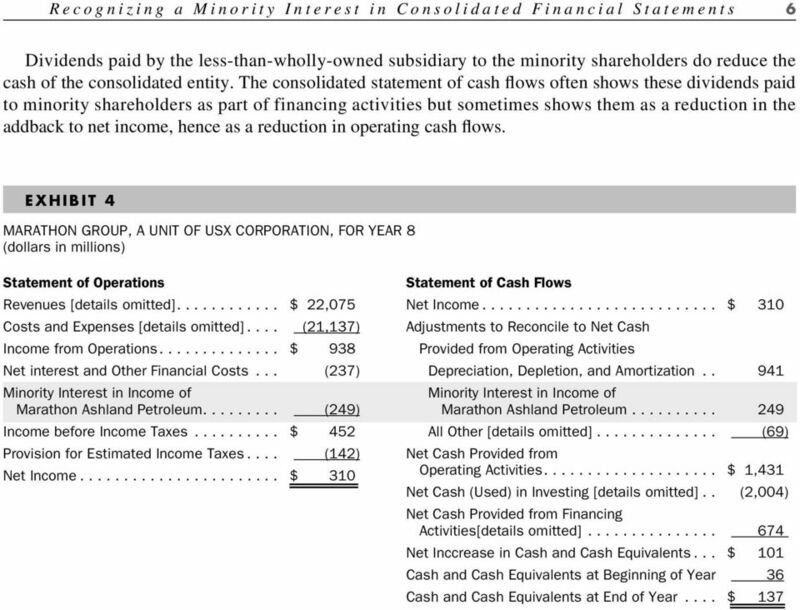 (4) To recognize the 20 percent minority interests in the earnings and net assets of Company S. EFFECTS ON THE STATEMENT OF CASH FLOWS The consolidated income statement shows all the revenues and all the expenses of the less-than-wholly-owned subsidiary, but the parent cannot claim all the resulting income. The income statement, therefore, shows the subtraction for the minority s interest in the subsidiary s income, but this subtraction does not use the cash of the consolidated entity. Hence, if the consolidated entity uses the indirect method of reporting operating cash flows, starting with net income, it must add back the charge in deriving cash from operations. Exhibit 4 illustrates these presentations for Marathon Group (oil/gas companies affiliated with U.S. Steel as part of USX Corporation; the presentations are condensed from its report for a recent year. 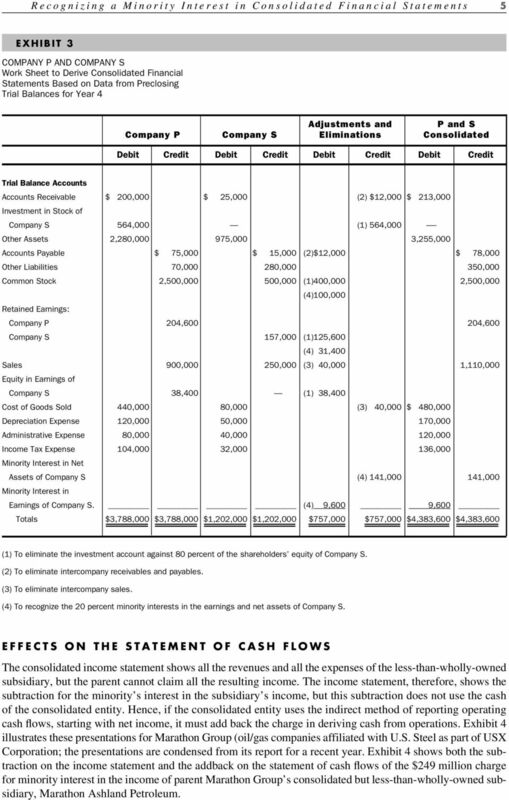 Exhibit 4 shows both the subtraction on the income statement and the addback on the statement of cash flows of the $249 million charge for minority interest in the income of parent Marathon Group s consolidated but less-than-wholly-owned subsidiary, Marathon Ashland Petroleum. 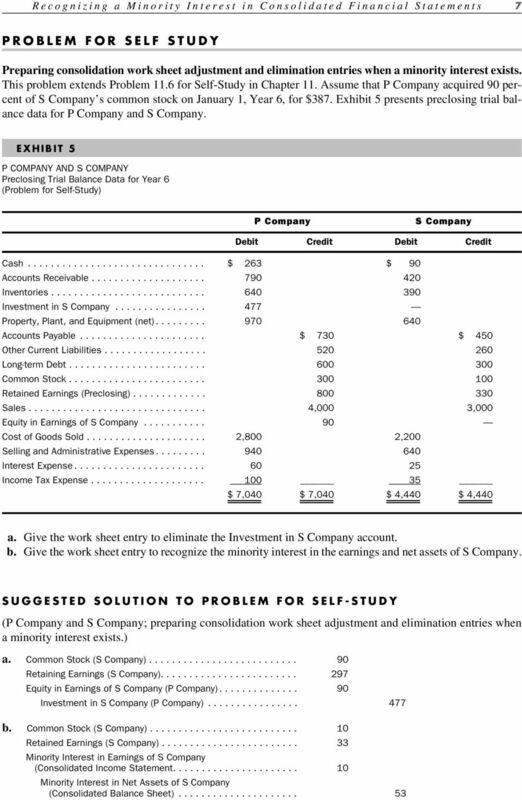 8 Recognizing a Minority Interest in Consolidated Financial Statements 8 PROBLEMS MININT 1. Preparing consolidation work sheet entries when a minority interest exists. Refer to Problem 48 in Chapter 11. Assume that Peak Company paid $35,000 for a 70 percent interest in Valley Company on January 1 of the current year. Exhibit 6 shows the preclosing trial balances of Peak Company and Valley Company on December 31 of the current year. 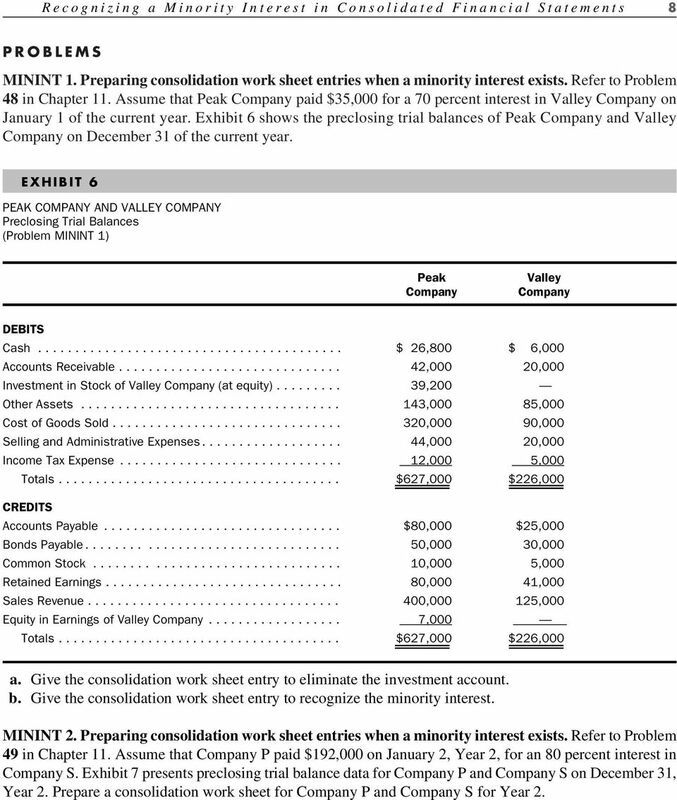 EXHIBIT 6 PEAK COMPANY AND VALLEY COMPANY Preclosing Trial Balances (Problem MININT 1) Peak Company Valley Company DEBITS Cash $ 26,800 $ 6,000 Accounts Receivable ,000 20,000 Investment in Stock of Valley Company (at equity) ,200 Other Assets ,000 85,000 Cost of Goods Sold ,000 90,000 Selling and Administrative Expenses ,000 20,000 Income Tax Expense ,000 5,000 Totals $627,000 $226,000 CREDITS Accounts Payable $80,000 $25,000 Bonds Payable ,000 30,000 Common Stock ,000 5,000 Retained Earnings ,000 41,000 Sales Revenue , ,000 Equity in Earnings of Valley Company ,000 Totals $627,000 $226,000 a. Give the consolidation work sheet entry to eliminate the investment account. b. Give the consolidation work sheet entry to recognize the minority interest. MININT 2. Preparing consolidation work sheet entries when a minority interest exists. Refer to Problem 49 in Chapter 11. Assume that Company P paid $192,000 on January 2, Year 2, for an 80 percent interest in Company S. Exhibit 7 presents preclosing trial balance data for Company P and Company S on December 31, Year 2. Prepare a consolidation work sheet for Company P and Company S for Year 2. 9 Recognizing a Minority Interest in Consolidated Financial Statements 9 EXHIBIT 7 COMPANY P AND COMPANY S Preclosing Trial Balances (Problem MININT 2) Peak Company Valley Company DEBITS Cash $ 26,800 $ 6,000 Accounts Receivable ,000 20,000 Investment in Stock of Valley Company (at equity) ,200 Other Assets ,000 85,000 Cost of Goods Sold ,000 90,000 Selling and Administrative Expenses ,000 20,000 Income Tax Expense ,000 5,000 Totals $627,000 $226,000 CREDITS Accounts Payable $ 80,000 $ 25,000 Bonds Payable ,000 30,000 Common Stock ,000 5,000 Retained Earnings ,000 41,000 Sales Revenue , ,000 Equity in Earnings of Valley Company 7,000 Totals $627,000 $226,000 MININT 3. Income statement and operating cash flow effects of equity method contrasted with consolidation of less-than-wholly-owned subsidiary. Company P owns 40 percent of the shares of Company E, which it accounts for with the equity method, and 90 percent of the shares of Company M, which it consolidates. For the year, both Company E and Company M had revenues of $400 and expenses of $300 and paid dividends of $30. Aside from its investments in Company E and Company M, Company P had revenues of $1,600 and expenses of $900 for the year. All three companies have receipts equal to revenues and expenditures equal to expenses, so that for each company net income equals cash flow from operations. Prepare Company P s consolidated income statement for the year and its consolidated cash flow from operations using the indirect method.